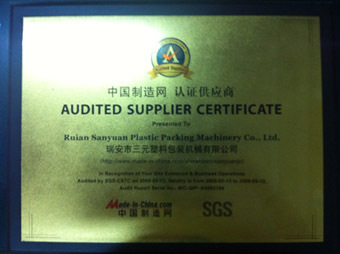 About us-Sanyuan plastic packing machinery co.,ltd. 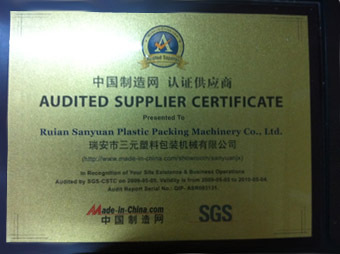 Ruian Sanyuan plastic packing machinery co.,ltd. with advanced technological equipments, tremendous technical strength, rich manufacturing experience and reliable product quality, our company can develop new products through cooperating with relevant scientific and research units, universities and institutions and provide equipment, technology, raw material and overall for the enterprises engaging in producing various plastic bag products. Zhejiang Ruian city sanyuan Plastic Packing Machinery Co., LTD is a professional manufacturer of film blowing machine, bag making machine, recycling machine, cling film making machine, printing machine and auxiliary machines. We are a high-tech enterprise focus on the designing, manufacturing, trading, and service. We've set the goal of "manufacturing the best products, establishing the best brand, executing the best management, in response to the globalization competition". We actively adapt the advantages of our international counterparts and imported high techniques to the research and development of new products and improvement of techniques. At the year 2003, we succeeded in manufacturing auto-punch bag making machines by using the most advanced technique in china. We have fine manufacture management and quality inspection systems to ensure that every machine is perfect in quality. We provide considerate service and regard our customers as great treasure. We have 40 sales spots in China and have established sales relationships with 12 countries now. We are ready to provide good and prompt pre-sales and after sales service. You can trust our products by full percent. From now on, we will import advanced and better manufacturing facilities to upgrade our capability. It's our honor to serve you with our best products and services. Our company was located in the beautiful & famous city of cultural & historical-Ruian City, near the Weizhou city district & Yongtai Express way in the Ruian city, near the Weizhou city district &Yongtai Express way in the Ruian city and Wenzhou city is only 30km, and tis traffic is very fast and convenient. Finally, we cordially welcome Old&New clients from the home & abroad to strengthen the connection with us, and mutually negotiate & promote the sharing development.